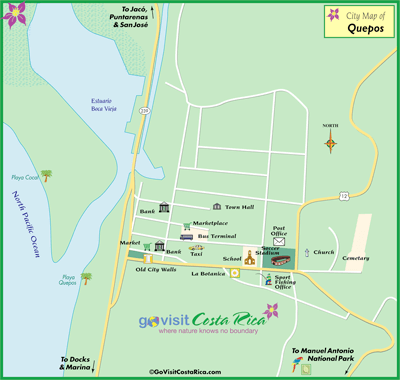 The Puerto Quepos cruise port has 6 blocks of bars, shops, hotels, restaurants and galleries. Cruise ships anchor and tender to the marina. It is just a short walk into town. Puerto Quepos drapes itself across a tropical inlet surrounded by primary rainforest. The village center is a delightful six-block square of restaurants, bars, hotels, bakeries, art galleries and gift shops, all fronted by the main beach and sportfishing fleet. Quepos is growing quickly yet maintains many of its sleepy and humble beginnings. Go catch a Pacific Sailfish or Marlin! Tours available everyday and you can rent the whole boat or split trips with others. Take the bus in town to Manuel Antonio beach, it costs about one USD round trip and is a fun ride, every 30 mins. A visit to Puerto Quepos is not complete without going to Manual Antonio National Park. $16 USD entry fee. Closed Mondays. It lies just a few minutes South of Quepos. The Manuel Antonio National Park is the smallest of Costa Rican national parks but the place is rich in wildlife and stunningly beautiful beaches. Note that the beaches in Quepos are polluted and not recommended for swimming. Go over the hill to Manuel Antonio instead. Downtown Quepos is a small checkerboard of dusty streets that are lined with a mix of local- and tourist-oriented shops, businesses, markets, restaurants and cafes. A Saturday morning produce market sets up along the beach in Puerto Quepos.